A bipotentiostat capable of independently controlling two working electrodes in a single electrochemical cell, with hardware synchronised start. AND a 2-channel potentiostat with industry leading specifications; Control two entirely separate electrochemical cells. 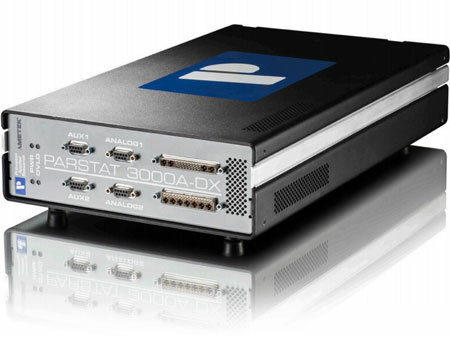 This new instrument has the same compact footprint as the PARSTAT 3000A. It includes both a high voltage and a high current channel, as well as EIS functionality on both channels. 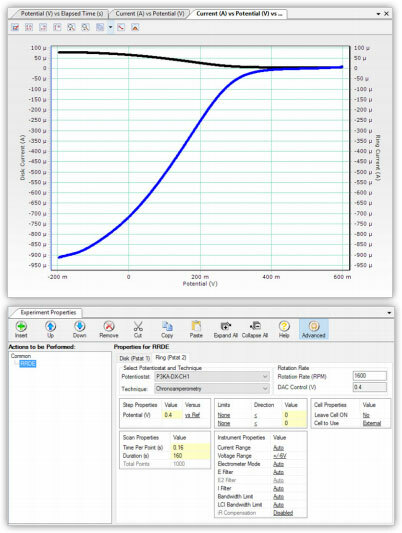 As a true bipotentiostat, the PARSTAT 3000A-DX controls the signal and measures the response of two different working electrodes in the same cell, with separate or shared reference and counter electrodes. Rotators, RRDE electrodes and associated accessories are also available for a complete RRDE setup. 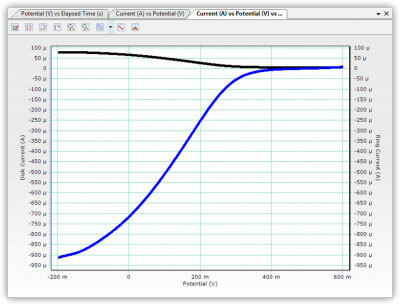 Plot disk and ring current against disk potential in a single graph, so the data can be interpreted easily.